Today I received an email from my Food Bloggers Los Angeles group announcing there will be a Holiday Cookie Exchange on Saturday, December 3rd. Do you know what that means? OMG! It’s almost Christmas!! And I haven’t even started my Christmas shopping. I don’t know where my Christmas tree decorations are! I have no idea who is coming over for dinner. I don’t even know what I’m cooking for dinner! Heeeeelllpp! Ok, seriously, it goaded me into thinking about what cookies I might want to bring to the Cookie Exchange. Chocolate Chips, Gingersnaps and Snickerdoodles won’t do, because they’re everyday treats we make all year. I am seriously considering my Linzer Cookies, though. They’re a Christmas tradition at our house. Oh goodie, I’m looking forward to all the cookies everyone will be bringing to the Exchange, plus the recipes. 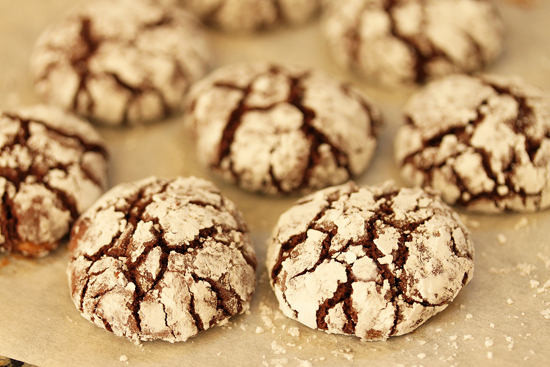 When I was making these Chocolate Crackles, I had gone into my office at the other end of the house while the first batch was baking. The timer went off and as I walked into the living room, I was almost knocked over by the smell of chocolate that was undulating out of the kitchen. Thick and resonant. Is there anything that smells like something baked with chocolate? So delicious. I got this recipe from a friend back in the day. I had gone to her house for a brunch and these Chocolate Crackles were on the buffet table. After one bite I knew I had to have the recipe, which she generously supplied. I have to laugh now when I look at that scrap of paper. It lists the ingredients, the temperature and baking time. That’s it. No method, whatsoever. But that’s what we do sometimes, don’t we? Thank you, LeeAnn. 1. Preheat oven to 350 degrees F. Prepare 4 sheets of parchment and place one sheet on doubled pans. 2. Place the chocolate in a large stainless steel bowl and set on a sauce pan containing 1 inch of simmering water. Do not let bottom of bowl touch the water. Stir occasionally until completely melted. Remove from heat and let cool to barely warm. 3. Add the brown sugar, oil, eggs and vanilla to the melted chocolate. Mix with a fork until homogenous. 4. Sprinkle baking powder and salt over mixture and incorporate. Add flour and mix thoroughly to form a dough. Add nuts, if using. It may resemble a thick batter. Let sit for 15 minutes to firm up, as chocolate cools. 5. With two teaspoons, form walnut-sized portions of dough into balls or use a 1-tablespoon-sized ice cream scoop. Place balls in bowl with powdered sugar and coat completely. Shake off any thick excess of powered sugar. 6. 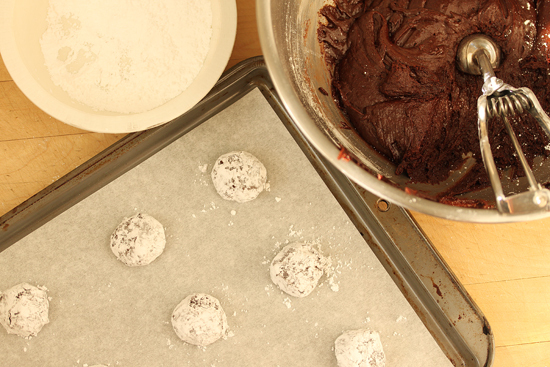 Place sugared balls on parchment on doubled cookie sheet 2 inches apart and bake for 10-12 minutes. Cool on parchment on flat surface. Remove cookies from parchment with a small sharp knife. Store in air-tight container. I am not a huge chocolate fan but everyone in my family is, therefore I will be making these really soon. How funny…I was just thinking about Christmas cookies. Thank you for sharing these delicious chocolate treats. I hope you are having a terrific Tuesday morning. I’m about to head off to work and begin my day. Much love and hugs from Austin! These look delicious. Did you use light or dark brown sugar? Also, how do you think they would turn out if I did not roll them in powdered sugar? Thanks. 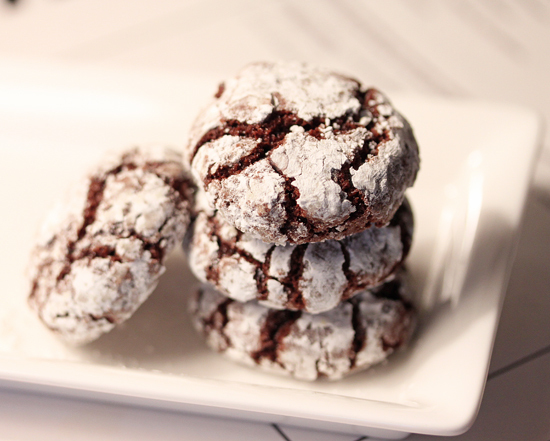 I made these cookies last night but without the powdered sugar. They were absolutely fabulous! My husband ate 6 – literally – before I even had a chance to stick them on a serving plate. I ended up using dark brown sugar. They also came out a bit flat for my liking (visual only) so next time I’m going to cut back on the oil. Thank you for sharing this recipe!